Editor’s comment: Please note that the This or That column is not a comparison report between two vehicles, but rather a feature that enables us, in an idyllic world, to add a collectible vehicle into our dream garage on a regular basis, but with a catch: We can only pick one vehicle from this pairing, and it has to be for enjoyment purposes rather than as an investment. So let’s climb in to the ultimate automotive fantasy time machine and have a little fun. As you’ve no doubt observed, the This or That — Summer Series is dedicated to decades of drop-top driving. 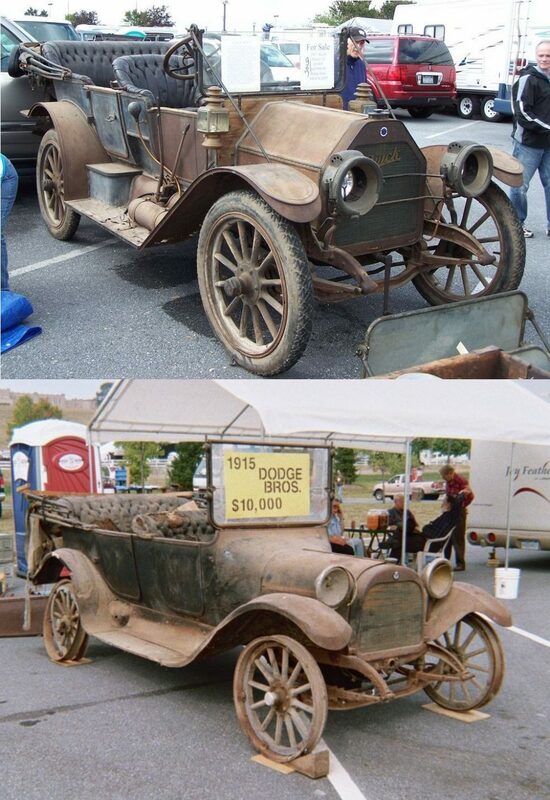 But, rather than have you pick from finely restored examples we’ve previously featured in our family of publications, I thought it was time to mix it up and give you the choice between two barn-find project cars we’ve stumbled upon over the years at the AACA Hershey meet: a 1911 Buick or 1915 Dodge? Let’s start with the Buick that, as noted in the caption, is a Model 21 Touring from the 1911 model year. The Touring body style was one of three offered in the Model 21 series, which included a “closed-coupled touring body with detachable tonneau,” or with a single-position rumble seat. Starting price was $1,500 (add $50 for the rumble-seat style). Each was built atop a 110-inch-wheelbase chassis with a 56-inch track width that supported the installation of 255-cu.in. four-cylinder rated for 40 hp, backed by a three-speed manual transmission. Wood-spoke wheels were large enough to accept 34 x 4 tires, though a 32 x 4 arrangement was optional, as was an extra-wide 60-inch track. Bodies were painted a single color — Buick green — while interiors were finished in black leather complemented by a three-ply walnut veneered instrument panel. The aforementioned wheels were painted green as well, although they were also offered in cream as an extra-cost item. Per Buick factory literature, other options included a top, windshield, speedometer, tire irons, trunk rack, and Prest-O-Lite equipment rather than a gas generator. Buick’s 1911 Model 21 line turned out to be a comparative rarity in the division’s early history, as it was a one-year-only series. To date, known Buick records indicate that just 3,000 were collectively built; no body style breakout has been discovered. As to Dodge, 1915 was the year in which the fledgling company witnessed its first full season of automobile production. One resource lists the 1915 cars as being Model 30-35 units, offered in two-door Roadster and four-door Touring body styles (the latter pictured above); though the Roadster was a new addition to the line since production began in 1914 (Editor’s note: Many published reports agree that 1914 cars are considered early 1915 models). Starting price, no matter the body type, was $785, which included a windshield, folding top, and speedometer. Like Buick, the new Dodge rode on a 110-inch-wheelbase chassis, though tire sizes was a skosh smaller at 33 x 4. Power to motivate the chassis was supplied by a 212.3-cu.in. four-cylinder that touted 35 hp, and, like much of the industry, a three-speed manual transferred output to the rear differential. Marketed as an upscale Ford, Dodge painted their cars black, complemented by black leather interiors. Options included a spare tire, side curtains, windshield wiper, and Moto-Meter, among other items. Exact production figures seems to be up for some debate, even today; however “official” output of 1914-’15 Dodge Touring and Roadster models culminates at 45,000. An exact body style breakout is not known. If you follow us on our Hemmings Facebook page, we pose a question when we post car corral barn-finds from years past: Would you restore, modify, drive as-is, or part out? In this money-is-no-object fantasy, let’s nix the idea of modifying and parting these early gems, leaving you to answer not only which of the two cars you would pick, but also avenue would you take. Restore it, or make it road-worthy and enjoy as-is?